Star Trek Vol. 6: After Darkness speaks well for IDW's ongoing "new Trek" series. Writer Mike Johnson gets the tone and voice of the movie Trek characters perfectly; though the trappings are familiar, this clearly feels like a story told within the new universe and not just The Original Series with new faces. In fact, After Darkness is even a little more Trek-y than the recent Into Darkness movie, with some nice sci-fi technobabble in the main story's conclusion. Really the only place this book struggles is in serving as a follow-up to Into Darkness itself. The book is called "After Darkness" and takes place after Darkness, but the story is mostly tertiary to the movie; aside from a couple of cut-scenes, it wouldn't have been hard to set this story after Star Trek and before Into Darkness. That's a tiny quibble, however, since I wasn't so impressed with Into Darkness and found After Darkness to be a rousing story irrespective. The main three-part story of After Darkness is probably one whose plot will be obvious to most Trek fans. Vulcan is destroyed, Spock is dating Uhura ... so what happens when Spock enters pon farr? Johnson handles it all perfectly in-character for these characters: Uhura is understandably upset at the idea of Spock undergoing a mating ritual with someone else; McCoy decries Vulcan barbarianism instead of treating Spock with modern medicine; and Kirk must once again balance his concern for his friend with respecting Vulcan tradition and the ideals of Starfleet. Spock ultimately sets off from Vulcan in a maddened haze, joining a group of "lost" emotional Vulcans. Johnson gets Kirk exactly right here; Kirk was willing to listen to the Vulcans in the beginning, but now he goes his own way in trying to rescue Spock -- by beaming all twenty-five crazed Vulcans into the Enterprise's cargo hold. The solution is wonderfully absurd, but even better are the next pages when Chekov and Into Darkness's Carol Marcus try to explain how they might use the transporters to resurrect a bit of the destroyed planet Vulcan's atmosphere in order to temper the pon farr. It's a bit of "conference room theoretics" more common on Next Generation than the original series -- and largely foreign in the new Star Trek movies -- that gives the story a strong, welcome Trek vibe. The final single-issue story finds the Enterprise investigating a Gorn attack on a group of miners, though as is typical the truth turns out to be something else. The story's twist is a little obvious, but again it's refreshing to find the key Trek elements here -- a new world and civilization, a question of moral relativism at the heart of the story, and so on. Neither of these stories, however, necessarily need Into Darkness to be told. There are a few references to Into Darkness -- Carol Marcus's presence, Section 31, and some talk of Kirk's super Khan blood -- but in fact After Darkness spends more time referring to things that happened in the previous twenty issues in this Star Trek comics series than it does to the movies. Only having seen Into Darkness isn't enough to understand every nuance of this book, which may alienate casual fans, though the broad strokes are comprehensible enough; After Darkness is a better advertisement for its own ongoing series than it is a jumping-on point for interested moviegoers. IDW's pattern has been to collect the Star Trek title in four-issue increments. It works here because the reader gets a self-contained story that doesn't feel too short, though I'd as soon wait for IDW to release a meatier omnibus edition. After Darkness would work better as a movie sequel in my opinion if IDW might have collected it with the next four issues of the series after this, a storyline called "Khitomer Conflict." Trek fans will know what movie aliens that story will include and why it might make for a better follow-up book to Into Darkness. Artist Erfan Fajar does a good job in the main story with depictions that are reminiscent of the Star Trek actors without being too distracting. The paneling gets a little large toward the end between Fajar and co-artist Agri Karuniawan, and it makes the story feel a tad decompressed, though Johnson (or the letterer) uses this well to split the characters' dialogues such to evoke the cadence of the actors' deliveries. Claudia Balboni draws with a more stripped-down style in the final issue, versus Fajar's rounder figures and some lusher coloring, and for someone unfamiliar with the Star Trek comics, it was interesting for me to see the movie Trek characters presented in these two similar but different ways. I'm often wary of media tie-in series printed released while the media is ongoing; from DC's Star Trek comics to Topps's X-Files, I don't much want to read a comic that's going to be contradicted later by the show or where the writer can't make any significant changes to the characters. 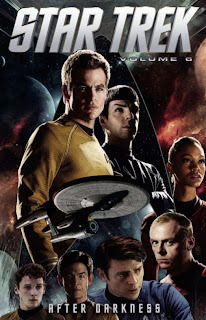 Trek producer Robert Orci's presence on this title (and Mike Johnson works for Orci), the amount of significant internal continuity Star Trek Vol. 6: After Darkness has, and even that some references to the comic adventure were made in Into Darkness (the Tribbles, among others) all make me feel more confident than IDW's Star Trek series is authentic. Johnson succeeds in making me want to read more of this series, though I get the strong suggestion I'd be better off starting with the first book before I continue to Star Trek Vol. 7. Later this week, the adventures of Ania Solo in Star Wars: Legacy II.